curl it, the curls remain bigger and bouncier for longer. With Bumble & Bumble, I always do my research before splashing out on their hair treatments, and after much reading, it seemed that the Bumble & Bumble Quenching Masque was the one for me. I use this only in extreme circumstances. Before a special occasion, or whenever my hair is terribly thirsty. If my ends get so dry that they poke out at weird angles then I know it’s time to bring in the big guns. I leave the mask on my shampooed hair for ten minutes while enjoying a face mask, and rinse out to freshly luscious locks – the difference this one product makes is insane! Finally, my essential tool of the trade which is a miracle worked when it comes to detangling either wet or dry locks is the Aveda Wooden Paddle Brush. It’s incredibly lightweight and manages to untangle even the most dread-lock like lock, plus the extended bristles give you a mini massage when you use on the scalp! Have you tried any of these products? 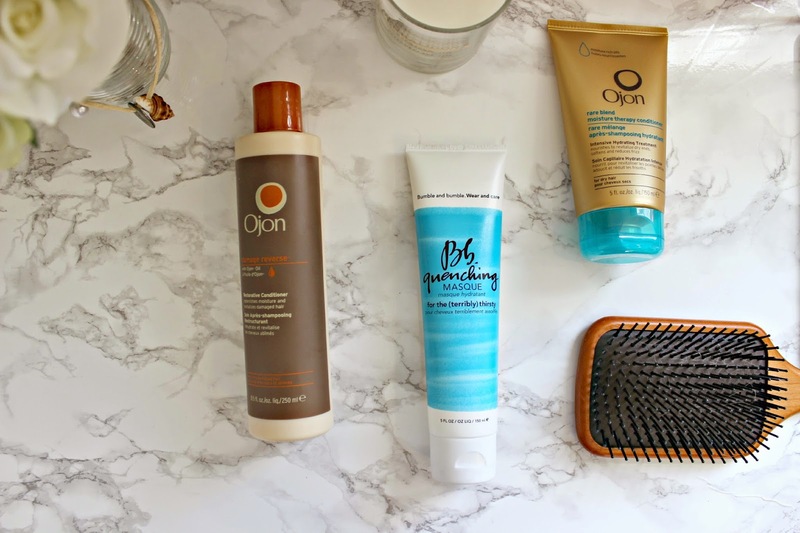 What are your Dry Hair Remedy essentials?